has devoted to making this happen. so many wonderful new bloggers. many of us would never have known existed!!! where Kimberly is living the simple life with her husband on the shores of Lake Superior in Ontario Woods, Canada. so keep checking here for one coming in the future. reality (we all know there are many others!). (for the time being anyway!). and then damaged by rain! Congratulations to Kimberly on her win of the lace collage. What a beautiful lace book. Your creations are so lovely, a joy to behold. So glad you have survived the fires and that you were blessed with rain. Your bouquet of roses is beautiful. Happy to read you had rain!! Congratulations to the winner of your collage. It is so beautiful, I love all the laces and fabrics you used. such a beautiful lace book with so many layers of wonderful fabric. great details and sewing work. big congrats to the winner. Oh dear, are you sure it isn't Kimberly from the US? Suzy, you always create such beauty, this lace book is over-the-top gorgeous. It is frothy and whimsical. Congratulations to a very lucky winner. AND to the reciever of this amazing journal. So faboloues in every way, filled with the beauty of "spiders web" laces and fabrics, so fitting to the world of faries and elves, so fragile to look, and such soft and lovely colours. A masterpiece again, my dearest Suzy, and with those exquisite drawings . I don`t have to tell you, that I love your journal, sweet friend. Sending love to you too, dearest Syzy-with warm hugs. 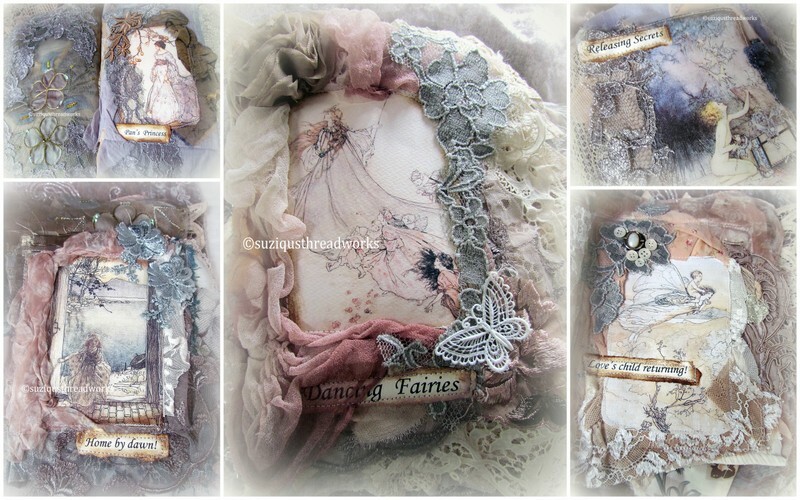 what could be more beautiful and magical than one of your lace books with fairies as the theme!! Absolutely gorgeous. Love the soft greys and pinks. Perfect for fairies. Another treasure. I can't tell you how excited I am to be the winner of your lovely lace collage! And 'Nature's Bride' is so appropriate considering that I live here in the middle of nature! I'm glad that you're faring the fires and are safe and sound too. Beautiful work! So many layers to it and really lovely. Your fairie book is truly magical! Congrats's to the Blog Party winner..it has been so much fun! Congrats to your winner! I am in awe of your beautiful work! I'm having so much fun looking around on your blog! Sweet hugs! Your lace fairy book is utterly gorgeous, so soft and wispy, absolutely beautiful and the little pincushion is adorable. Thank you once again for sharing your wonderful works with us. Really love the Pan Princess book. As usual, a work of art. So happy that you got some rain and the fires are gone. what an amazing gift to receive from you! I am such a fan of Rackham's illustrations....such a beautiful book Suzy! congratulations to the winner; what a joy to have won Suzy's beautiful work. Wonderful work, as you use to do! Nature's bride is very charming, and I love so much Arthur Rackham pictures too. I send you pictures of one quilt I made with one of his picture! Hi sweet Suzy-- what a wonderful treasure will soon be on it's way to your lucky winner! My goodness- what a beautiful creation you have made! Your fairy lace book is nothing short of magnificent! I can't imagine the amount of work that goes into these beautiful creations. I'd love to see your lace stash- it would be amazing!! Congrats to Kimberly the winner of the collage. I so love the new fairy book, your work is so beautifully amazing! I knew I could get my lace fix here Suzy. I don't know how you find the time to make so much and with so much detail. Your sewing machine must fly like the wind. I am glad you received some relief with rain. I know how desperately you needed it. We have had too much it seems this winter. It's never perfect this weather thing is it? Congrats to the lucky, lucky, winner!! Your fairy journal is another masterpiece of beauty and grace. The pin cushion is amazing. Someday I hope to be lucky enough to win one of your amazing creations!! Hi Suzy, your Arthur Rackham Fairies book is enchanting.Love the idea of Fantasy being the vehicle to escape to the Magical World of the imagination.We all need that! Congratulations to the lucky winner! What a beautiful creation you have fashioned, Suzy. Another stunning journal Suzy! Hope you have a great week. So happy to hear you had some rain, what a relief that must have been! I'm so happy to hear you got rain. Congratulations to the lucky winner.Have a wonderful week. Congratulations to Kimberley! Will have to pay a visit to her blog since she lives in my part of the world. Absolutely gorgeous fairy book - I'm beyond sure that the recipient will be thrilled. Your Fairy book is so Gorgeous Suzy. I can't even imagine how many hours went into creating it. Breathtaking. Congrats to your lucky winner too.